Hunting at night is an iffy proposition for most hunters. Heavy restrictions and steep penalties await those who break the rules, and many states severely restrict if not outright ban any form of hunting lights. To make matters more difficult, laws and regulations vary wildly from one state to the next, and just to throw a little more spice in the mix, laws can change from season to season as well with little notice or warning. While it is certainly understandable why night hunting with lights is so heavily restricted, there are also many species that because of their characteristics and habits, should be considered exceptions to the rules. As well as non native invasive species which cause untold amounts of damage both environmentally and financially, unchecked growth in predator species, nuisance species, and animals that pose a clear danger to humans and domesticated animals all pose a challenge for those regulating hunting. This year many states have begun to reassess their stance on night hunting and the use of lights. With coyote and feral pig populations beginning to reach record proportions, damages to property and negative impacts on native species are seeing a corresponding rise in frequency and intensity. As more animal-human incidents arise, states are being forced to take notice and address the situation. With current economic conditions being far from conducive to solutions based in official responses such as federally and locally funded control programs and efforts, lawmakers have been forced to seek more cost effective alternatives. Of the alternatives available, relaxing regulations on night hunting rules offers the best potential for effective control of these damaging species with the least cost and negative environmental effects. Most states already allow some forms of night hunting and have done so for several years with good results. Feral pigs are one of the species most commonly exempted from night hunting regulations, and often there is little regulation at all. Hunters can often take as many feral pigs as they want, under almost any conditions without and fear of reprisal due to the severe nature of the feral pig problem. To a lesser extent, coyotes are also often exempted from some knighting hunting regulations or allowed under special conditions that allow the use of artificial lights due to their rapidly growing numbers and potential to cause severe damage to domestic and range animals. On the other hand however, some states allow no night hunting with any form of lighting at all, and only special conditions and allowances under heavy regulation allow taking of even nuisance animals with a light. For 2012, this is changing for some states, and night hunting and the use of lights is likely going to undergo a transformation as more and more hunters begin to take advantage of relaxed or new regulations. Night hunting with lights is a time tested and well proven effective method of taking many forms of game. Coyotes and feral pigs in particular however, are fairly intelligent and quickly learn to avoid daylight activity when hunting pressure is highest. Night hunting these animals with spotlights is effective because it allows hunters to use these very adaptations the animals have adopted against them. Night hunting affords hunters the opportunity to use darkness as added cover and devise strategies that incorporate both the elements of steal as well as high powered illumination as contradictory as that may first appear. Hunters often will employ blinds, or simply identify areas of high prey activity and use natural cover as a starting point. Working in pairs, one hunter will handle taking the shot, while the other manages illumination. IN one method, once activity is noted, a high power spotlight is quickly switched on and the animal to be taken illuminated, the designated shooter then simply lines up and waits his for his best opportunity to take the shot. In other methods, again working in pairs, hunters will have one person slowly pan a powerful light in a careful and slow horizontal pattern 360 degrees around their position until the eyeshine of a potential target is noted. Once found and the animal takes an advantageous position, the animal is fully illuminated and the shot taken. There are a lot of variations on these methods, but the main constant here is the use of a powerful spotlight. To get the best results, a spotlight must be powerful enough to easily illuminate a target at the farthest range a hunter is comfortable with. Other considerations are the type of lamp used, how much power it requires, and its overall resistance to poor weather conditions and rough handling. 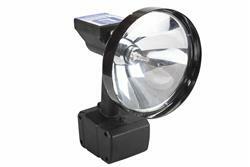 Halogen spotlights are probably the least desirable in terms of power, efficiency and durability as they require a lot of power to produce a strong enough beam, which in turn means rechargeable units will have short run times. Additionally, halogen spotlights are basically just an incandescent bulb inside a portable housing, and as such have a fragile wire filament that is easily broken should the spotlight be dropped or roughly handled. HID hunting spotlights offer great improvement over halogen spotlights, with much higher output and efficiency being their main desirable traits. The color of the light they produce is of much better quality as well, providing sharper contrast and better detail of whatever they illuminate. High power HID spotlights are also far more efficient, which gives portable rechargeable units a much longer runtime. Durability is also enhanced in the HID due to the fact that although a glass bulb is still used, there is no wire filament to break or burn out unexpectedly. These days, most hunters are gravitating to the HID spotlights for precisely these reasons and with excellent results. Whether or not your particular state is among those considering changes to their night time hunting and lighting use regulation is difficult to determine without directly checking with your states regulating agencies. As noted earlier, regulations vary and change wildly from state to state, and only your local authorities can tell you for certain what the current status of regulations which may affect you are. Some states which are currently considering or already having made changes to their night hunting regulations include North Carolina, Washington, Tennessee, Florida, Arizona, and Texas. Check your local wildlife and natural resources agencies to learn more.